I received this beer from a friend who had it shipped to him from California as it is not available in the Northeast. There are a few online retailers that sell this beer but shipping charges really add up when buying beer online. This beer looks great; deep brown almost black with a thick tan head. Not a lot happening with the aroma, some rich malts and sweet chocolate but that is about it, not getting any coconut. Taste does have a little coconut but it is far from the dominant flavor. The roasted malts really dominate with a fair amount of sweetness. Overall this was a pleasant, easy drinking porter. Something I would enjoy on occasion but not on a regular basis. If you happen to be traveling out West keep an eye out for it but I wouldn’t bother trading for it. Brewers Website: Maui Brewing Co. 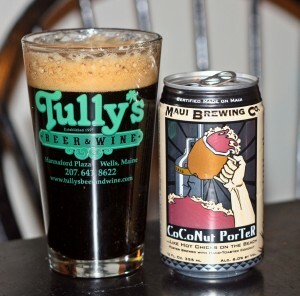 Brewers Description: Our CoCoNut PorTeR is a fresh handcrafted robust porter brewed with six varieties of malted barley, hops and hand toasted coconut. It begins with a malty-toasted coconut aroma followed by a rich, silky feel with tastes of dark malt, chocolate and hints of coffee. It then finished with flavors of toasted coconut and hoppy spice to balance the finish.